Manicure Monday... I'm late, I know. lol I have a good excuse though... AJ stayed home yesterday so we were soaking up some quality time. It is really sweet seeing how much Oliver really enjoys having his daddy home during the day. I have been working on a personalized calendar for my mom. Editing and arranging photos. 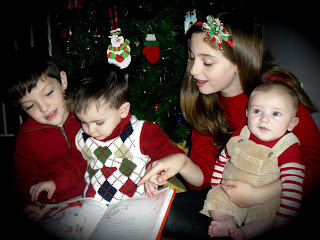 I also took some pictures of the kids for our holiday card. My hand is so sore from being on the computer. I am thrilled with how some of the pictures are turning out. Here is the one going on our card. I'm pretty pleased with my at home photo session. On to today's manicure, which I just finished. Yay for naptime!! I am loving this color! It only 2 coats. It went on smooth and easy. There is a gorgeous shimmery sparkle to it! I see a bit of purple in it. I've been wanting it for a few weeks, so glad I picked it up! What color are you wearing this week? ?